TS: You always have interesting opinions about the cable news business. Where do you think you stand in the cable news landscape and what do you make of your competition? SR: Let's start with the facts. We're the hottest. No one brings hottness like HOTT News. Our on-air talent (and off-air talent) are all hot. So we've got the edge there. Substance doesn't matter (obviously) but we also score highly on substance. Without even trying (in fact, in trying not to have substance) we actually have more substance than our competitors. It's true in daytime and in prime time. TS: Can you be more specific? SR: I can, but I like to avoid specifics. C'mon, this isn't rocket science. CNN is floating in the deep end, flailing its arms wildly in search of a life jacket. MSNBC is busy doing a fine impression of Fox News. Current TV lasted a few weeks. So we're shooting up the charts. TS: You compare MSNBC to Fox News. Isn't that false equivalency? SR: Nope. Increasingly, they are offering the same product. Obviously one is from the left and the other is from the right. No doubt Fox News is better at inventing reality. But overall, MSNBC and Fox News play loosely with a different set of half-truths. MSNBC just hired David Axlerod and Robert Gibbs as contributors. That kills their last shred of credibility. Period. TS: But isn't it perfectly reasonable that MSNBC take advantage of their political insights? SR: It's perfectly unreasonable. MSNBC's slogan should be "Inside Baseball" or "Horse Race Politics." That's all they have to offer. In that vein, Axlerod and Gibbs make a lot of sense. But the genre is called cable news for a reason. We are supposed to be in the business of delivering news. MSNBC and Fox News are both terrible at delivering news. SR: If there's a cruise ship disaster, you dial up CNN. Otherwise, don't even bother. TS: Your network continues to be a lightning rod for criticism. One observer even called you the "Hooters of cable news." How do you respond? SR: Awesome. That's right on target. I need to tweet that person immediately and offer a job. That's pithy and pitch perfect. That's the kind of honesty we need right now. Is the person who said that hot? SR: Don't be. Americans need news and they need it now. They like news delivered by hot people. We offer real news by really hot people. Don't over think it. This is good. Happy Valentine's Day. 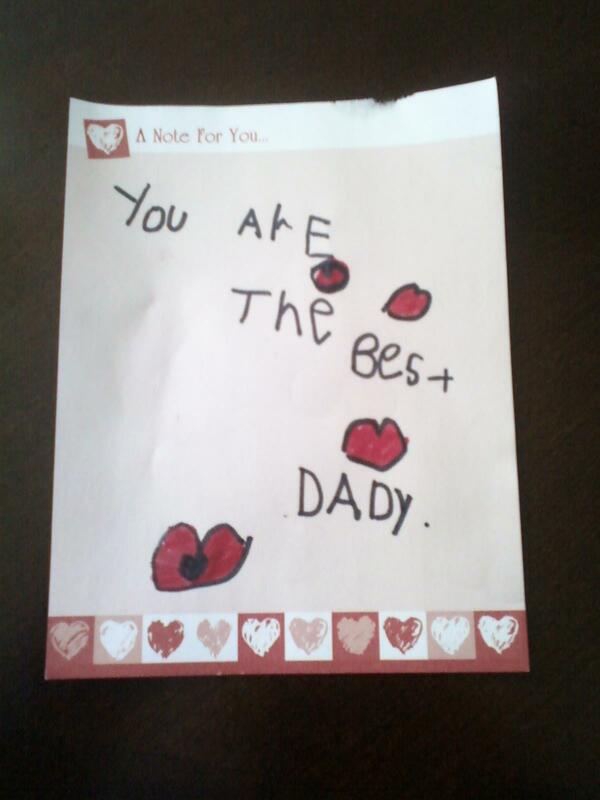 I was treated to a beautiful note from my 5-yr-old son this morning. 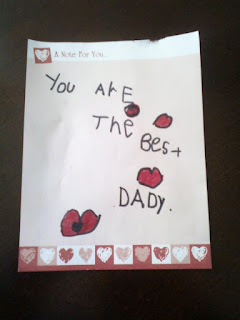 Easy for me to have a good day considering it began with a love note from my kid! May you have a good day too. Do you only call on students who raise their hands in class? This is a question I like to ask my colleagues when we talk shop about teaching. Keep in mind that I write from the perspective of someone who teaches classes with a maximum of forty students. My typical Introduction to Sociology class has forty students. But my Research Methods class never has more than twenty. So the ways I try to elicit class participation have a lot to do with my class sizes. When I first started teaching, I only called on students who raised their hands. That seemed like the natural way to go. But it wasn't long before I became comfortable calling on students who didn't raise their hands. I just wanted more people to join the conversation. I never want to embarrass a student or make them feel uncomfortable. I just want to try to give students a chance to express their points of view. I take a lot of interest in students who appear to be very shy. It seems like nothing would ever get them to raise their hands. But shy students have something to say too. More often than not, I am rewarded for calling on a student who didn't raise their hand. The student might be surprised at being called, but usually the student handles the situation well. The student generally does a good job of responding to my question. In return, the student hears something I say a lot in class: "Thank you." I am sincerely thankful when students contribute to discussions. So many interesting and unexpected things occur when more people join the conversation. Sometimes, calling on students who haven't raised their hands is just a practical thing to do. There are days when no hands are raised. There are moments when it feels like I'm pulling teeth. Sometimes all it takes is one student to spark the conversation. And in some cases that only happens when I call on a student who didn't raise their hand. Perhaps someone is reading this and thinking: "This guy is a real moron. He's actually writing something about calling on students. What a fool. They are students. They should be called on, no matter what." If anyone has that thought, I would remind the person that a teacher is taking a risk by calling on a student who didn't raise their hand. There are times when I have called on a student and their face has turned bright red. There are times when a student quietly says "I don't know" or "I'm not sure" or just gives me a blank look. They might be extremely shy, or sick, or tired, or startled, or confused, or just totally caught off guard. No one wants to be a deer in the headlights. So if I catch someone at the wrong moment, I apologize. The apology is for embarrassing them when that's what I have done. I suppose someone else might be reading this and thinking: "Who is the oversensitive professor who would apologize to students? They're supposed to be engaged. They're supposed to be prepared. Too bad if they're caught off guard." I disagree. Students lead complicated lives. Many are exhausted, many are overwhelmed with too much coursework, many are stressed by financial and personal problems, many have jobs to worry about too. So I'm not going to hassle a student for not having something to say at any given moment. It must also be said that some students don't want to say anything--ever. Some are afraid of what their peers will think, some are nervous about speaking in public, some have a speech impediment (please note that I have had students with speech impediments contribute to class discussions on a regular basis. I'm just saying that some students with speech impediments are reluctant to speak). So there are lots of reasons why people would prefer not to speak. And if a student asks me not to call on them (which I think has only happened once or twice), then I don't. Despite the potentially embarrassing moments that can flow from this approach, I will continue the practice. I'm not saying all teachers should do as I do (and I definitely respect my colleagues who don't call on students unless hands are raised). Overall, it works well for me and I'd like to hear what others have to say about the subject. As I mentioned earlier, I am often rewarded for calling on students who don't expect to speak. Recently, I called on a student in my Introduction to Sociology class who hadn't said anything in the first four weeks of class. It seemed to me she was paying close attention during class. I wanted to hear what she had to say. So I called on her. In the two classes since then, she has raised her hand several times. What if I had not called on her the first time? Would she have ever raised her hand? To me, the benefits to students (and to teachers) of calling on students without their hands raised outweigh the disadvantages. Mistakes will be made, no doubt. But teaching and learning are like all other forms of social interaction: not perfect, and sometimes embarrassing. We do the best we can. For my part, I strive to include as many students as possible in the process of learning. I'm learning, too. When I hear from more students, I learn more. Here are some video clips of Tim Lauger, my colleague at Niagara University, talking about the research he conducted that led to his book Real Gangstas. In the first clip, Tim answers my question about why he chose "Real Gangstas" as his title. In the next clip, Tim talks about urban ethnography. Tim spent a year and a half in the field. In the next clip, he talks about bringing participants to his home on one occasion.